The Hungarian Wax Pepper, as its name suggests, originated in Hungary. 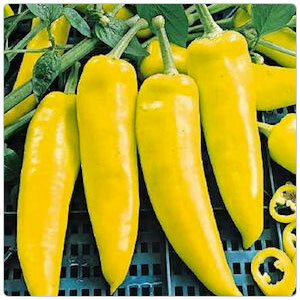 Also known as the Hot Wax Pepper, it is easily confused with the similar-looking banana pepper, but it is much hotter. The Hungarian Wax is harvested before complete maturity, while it is still yellow. If left to mature fully, these peppers would turn red, and their heat level would increase to nearly inedible. 5,000-15,000 Heat Units. The sweet, hot flavor of these peppers is very popular in mole sauces, and other traditional Latin dishes, soups and salads. They may be found pickled or sold fresh at stores or markets. In 1912 a chemists by the name of Wilbur Scoville, working for the Parke-Davis pharmaceutical company, developed a method to measure the heat level of chile peppers. The test is named after him, the "Scoville Organoleptic Test". It is a subjective dilution-taste procedure. In the original test, Wilbur blended pure ground Chiles with sugar-water and a panel of "testers" then sipped the solution, in increasingly diluted concentrations, until they reached the point that the liquid no longer burned their mouths. A number was then assigned to each chile pepper based on how much it needed to be diluted before they could no longer taste (feel) the heat. The pungency (or heat factor) of chile peppers is measured in multiples of 100 units. The sweet bell peppers at zero Scoville units to the mighty Naga Jolokia (Ghost Pepper), at a rating of 200,000 or more, indicating that their extract must be diluted over 200,000 times before the capsaicin presence is undetectable. The greatest weakness of the Scoville Organoleptic Test is its imprecision, because it relies on human subjectivity. Tasters taste only one sample per session..